St David’s Hall, opened in 1982, is the National Concert Hall and Conference Centre of Wales. Public and political desire for a such a venue dated back to the 1950s. 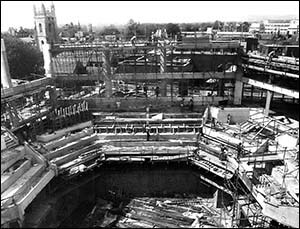 The hall took only five years from conception to completion. The end result was an auditorium with arguably the best acoustics in Europe. 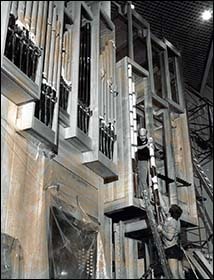 The photos on this page show the hall and its organ under construction. On 30 August 1982 a preview open day attracted 21,000 people. Days later came the first live performance, a free open rehearsal by the Cardiff Polyphonic Choir on 8 September. The first paid performance was by the Central Band of the Royal Air Force, closely followed by a recital from American organist Carlo Curley. The first pop concert was on 16 September 1982 – a sellout performance by British soul group Hot Chocolate. The venue was officially opened by the Queen Mother on 15 February 1983. Tom Jones and Shirley Bassey are among the artists who enjoyed performing at the venue for several nights in the 1980s – and Manic Street Preachers first honed their craft whilst busking outside the front entrance as teenagers! Architects Seymour Harris Partnership had the tricky task of fitting a 2,000-seat, auditorium – with dressing rooms, bars, foyers, offices and conference facilities – into a cramped city-centre space. 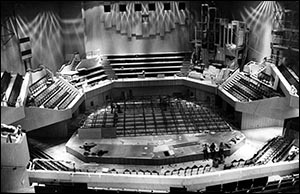 Consequently main contractors John Laing & Son Construction Ltd ensured that every inch of space was used effectively, giving the concert hall a highly unusual shape. In October 2016, media website Business Insider UK ranked St David’s Hall ninth in the Top 10 world’s best sounding concert halls, ahead of the Royal Albert Hall, Sydney Opera House and other famous venues. The Hall is owned, managed and funded by Cardiff Council with support from the Arts Council of Wales. Annually it hosts c.300 performances, attended by more than 250,000 people. It hosts major events including the BBC Cardiff Singer of the World, the International Concert Series, the Welsh Proms and the British Academy Cymru Awards. As well as hosting world-class classical music, ballets and opera, the auditorium has had a hugely diverse array of stars grace its stage including Sir Anthony Hopkins, U2, Adele, Sir Elton John, Ray Davies, Tina Turner, Miles Davis, Joe Calzaghe, Brian Wilson and Sir Ranulph Fiennes amongst many others. Countless comedians have also trodden the boards. The Hall’s smaller performance venue, the L3 Lounge, has provided valuable exposure for upcoming young performers, including Amy Winehouse, Jamie Cullum and John Bishop. The Hall enriched orchestral music in South Wales, with visits by the world’s greatest orchestras, conductors and soloists, and frequent performances by the BBC National Orchestra of Wales and orchestra of Welsh National Opera. It has also provided a platform for amateur ensembles, youth orchestras and the Cardiff Philharmonic Orchestra.